New rules proposed by the European Commission will give air passengers the right to disembark from a plane if it has been stood waiting on the tarmac for five hours. 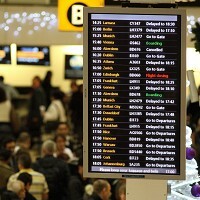 If the plans are approved by EU transport ministers and MEPs, airlines would also be legally required to provide information on airport delays or cancellations no later than 30 minutes after the plane was due to depart. They would also have to operate a more effective complaints procedure under the proposals, including acknowledging receipt of the complaint within one week and providing a formal reply within two months. The new rules are not likely to become law until 2014. EU officials say the failure to respond to correspondence from disgruntled passengers is one of the biggest complaints about the existing air traveller rights rules, introduced eight years ago. Airport hassles highlight the importance of taking out travel insurance, which covers passengers for delays and cancellations. EU Transport Commissioner Siim Kallas said: "It is very important that passenger rights do not just exist on paper. We all need to be able to rely on them when it matters most - when things go wrong."